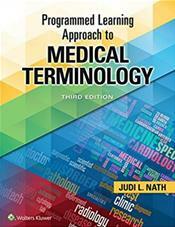 Programmed Learning Approach to Medical Terminology, 3rd Edition is ideal for self-paced study, classroom use, or distance learning. Reflecting current medical usage, the book facilitates study by including questions on the right side of each page and answers on the left. A bookmark (packaged with the text) allows students to cover the answers as they move down the page and reveal them as they go. This edition features a more concise presentation, new content, exercises in the book and online, and a robust array of online teaching and learning resources. ... NEW! Chapter-opening learning objectives prepare students for the content that follows. UPDATED! Pronunciations now match those in Stedman's Medical Dictionary but are shown phonetically to reflect the book's focus on oral communication. REVISED ART PROGRAM! More contemporary figures modernize the book's look and feel and each disease section now includes at least one photo.